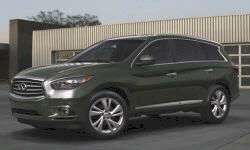 2013 Infiniti JX Pros and Cons: Why (Not) This Car? On its first attempt, Acura hit the bulls eye of the upscale crossover market with the fairly boxy, three-row MDX. Infiniti, on the other hand, opted for firmly suspended, relatively cramped two-row eggs that have been enjoyed by driving enthusiasts but ignored by nearly everyone else. Lesson learned, a dozen years behind the leader Infiniti finally has a three-row car-based crossover. Should Acura be worried? Real wood, brown leather, and some residual curves make for a warm ambiance. Why the 2013 Infiniti JX? Recently designed Infinitis have had very attractive interiors. For the JX, Infiniti adapted their design cues and materials to a family-oriented crossover. Inside the JX, the curves aren't as dramatic, the center console isn't as large, and the front bucket seats aren't as bucketed as in other Infinitis. But enough of the brand's typical posh, sporty ambiance remains to make the JX's interior perhaps the nicest in the segment. Rumor has it that the wife of an Infiniti executive is an awful driver. Inspired by his personal experience, this executive has made the brand a leader in driver assistance technologies (a.k.a. electronic nannies). The JX has the most nannies to date. To forward collision alert, automatic forward braking, lane departure warning, lane departure prevention, blind spot warning, blind spot prevention, moving object detection (front and rear), and rear cross-traffic detection Infiniti has added a new "backup collision intervention" (BCI) system that automatically stops the JX before it can back up into something. There's also my favorite first seen on the EX: an "around-view" monitor that combines inputs from multiple cameras to provide a top-down view of the vehicle and surrounding road. This feature makes parking fun. The crescent-shaped rearmost pillar doesn't work for me. But it is distinctive. Many buttons, but easy to reach and well organized. Unlike in the Acura and the Buick Enclave, the wood inside the Infiniti JX is the real thing, and it looks great. The brown leather (other colors are offered) also looks and feels appropriately warm and luxurious. The JX starts at $41,400 and can be optioned into the mid-fifties. A loaded MDX costs about the same, but many of the Infiniti's features aren't even available on the Acura. Adjust for these using TrueDelta's car price comparison tool and the JX winds up with a $3,700 advantage. Compared to a loaded 2012 Buick Enclave, a similarly-equipped Infiniti lists for about $1,900 less before adjusting for feature differences and about $3,200 less afterwards. I'm struggling to come up with a fifth reason for buying the Infiniti JX. Not because the rest of the vehicle is bad, but because in the great majority of aspects it's neither notably good nor notably bad compared to competitors. They're all fairly quick, smooth, and quiet. If I have to pick a fifth reason, then it's third row room and comfort. A Buick Enclave has a roomier third row, but both the Acura MDX and the Audi Q7 do worse. This said, the second row must be slid forward to provide legroom to people in the third row. The seats in both rearward rows are of the low-mounted, flat-cushioned variety typical of the segment, so they're not very comfortable for adults. You'll find a more adult-friendly second row in some large crossovers, especially those from Ford and Lincoln. Why Not the 2013 Infiniti JX? The JX offers about as much space for cargo behind the third row as the MDX. But neither offers enough cargo space for my family on a week-long vacation without folding at least half of the third row. There's more space behind the third row in a Buick Enclave. Best yet, the mechanism for the third-row seat in a Ford or Lincoln large crossover opens up a deep well when the seat is not folded. Consequently, these crossovers can carry more luggage than the others, in practice even more than on paper. The JX isn't an unattractive vehicle. But Infiniti's curvaceous design language inherently conflicts with the space efficiency demanded by large crossover buyers, and this conflict isn't managed especially well. Instead, a curvy front end has been grafted onto a boxy passenger compartment. I'm also not a fan of the "crescent-shaped" D-pillar we're told will distinguish all Infinitis going forward. Too flat, too low, and no foot room under the front seats. Better than some others, but this is not saying much. Adults can fit, but not comfortably. The Infiniti JX handles reasonably well for a large crossover, but an Acura MDX feels more athletic due to its lesser length, an active rear differential, and optional adaptive dampers (a must-have for anyone who cares about handling). Either an Audi Q7 or Mazda CX-9 is also a bit more fun to drive than the JX. In most ways the Infiniti JX doesn't distinguish itself from the crowd, positively or negatively. If you like its styling or get turned on by safety nannies, then there's no compelling reason (with the possible exception of passenger and cargo room) to get something else. Nissan's ubiquitous 3.5-liter V6, here (as in the related Murano) good for 265 horsepower. My family's stuff wouldn't fit. Preview drive. Infiniti provided airfare, hotel, meals, and fueled, insured vehicles. 2013 Infiniti JX pros and cons, according to Michael Karesh: the best reasons for buying (or not buying) the 2013 Infiniti JX. Join TrueDelta to post your own impressions.